This concerns a habitable, earthlike moon orbiting a gas giant, which is not tidal locked, and has an elliptical orbit eccentric enough to avoid frequent deep winter freezes (the freezes do happen, but they are more like once a decade). The tidal range is higher than Earth's; I'm going to ballpark about 30m/100ft for the relevant area. I'm sorry for not showing numbers--I know I will have to fudge them a bit regardless to have this setup, and I'm not sure how useful they will be here (plus astronomy & physics is not my strong suit). I can try to write some up if specific numbers would be helpful. Anyway, on this world there's a non-spacefaring people living on a very difficult-to-reach island, and that island is what this question really is about. They know of continental land to their north, but in other directions they know nothing of and they're not super into finding out (i.e. it doesn't really matter what's over there, so if you think there should be land formations then there will be). Around 8 centuries ago another cultural group from the mainland was pushed out and made their way across the sea to this island somehow. 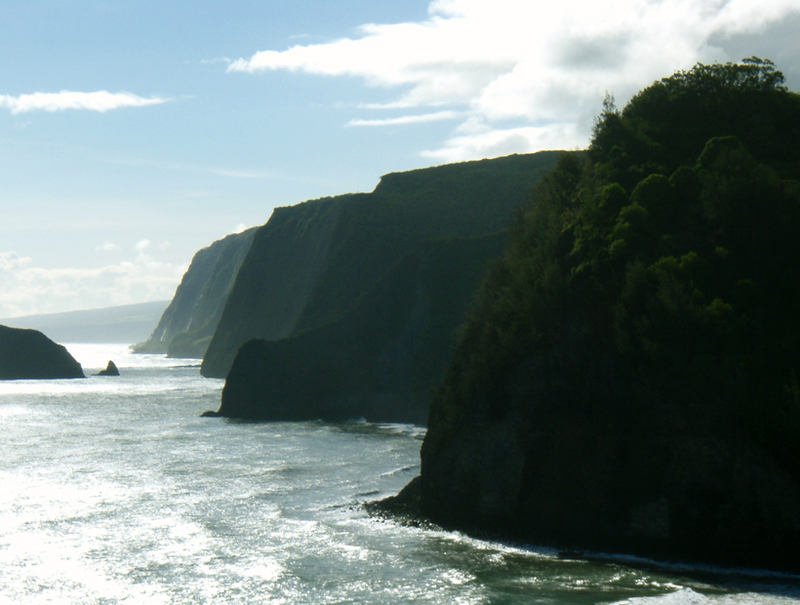 It's surrounded by steep cliffs and is only accessible during high tide in most locations. The native population has been living here for a very long time, at least a couple millenia. It's not a new island. The first question I have is: is it more likely that it is a volcanic island or a peninsula which was cut off from the mainland to the north by rising sea level/erosion? Which of these two options would be better if I wanted the island to, you know, not quickly erode into nothing by punishing tides, but also have the "wall" appearance of the cliffs, sort of like these (Thailand) or these (Bay of Fundy)? Are these sorts of monolith type rock structures even possible with very high tides? What would be the most likely composition of these cliffs? Ideally, I'd want very occasional large tides which rise up to the top of the cliffs, but usually never rises more than halfway, making it completely inaccessible by boat most of the time; I think this is possible because of the moon's elliptical orbit, and/or maybe with help from another moon whose orbit coincides with this one's every so often. Is this a plausible setup? If I understand your question correctly, we're talking about an island quite distant from the shores of the mainland which has been reached by a seafaring civilization. This island is only accessible at high tide because the rest of the time the island is separated by steep cliffs from normal water level. This sounds like a volcanic island. Volcanic islands pop up essentially wherever they want, as long as a mantle plume can form underneath it. This gives you a lot more freedom with the actual distance from mainland to island. If it's a part of the continent it's just a continental island. This requires the island to be part of the same tectonic plate as the continent and to be physically connected underneath the ocean. Both of these considerations limit how far continental islands are normally found from the continent itself. Volcanic islands can indeed have steep sides, which is one of the reasons Mehetia remains uninhabited- it's nearly impossible to land on. Continental islands often have steep cliffs due to constant wave action and uplift, but as you point out, that's likely to erode away completely over millenia. I'd also like to argue that tides themselves are not especially erosive forces. The water in a tide moves very slowly vertically, which makes it bad at removing rock from islands. Wind waves are the biggest erosive forces in the ocean, and I'd recommend focusing more on those to reshape surfaces than the large tides. This planet undergoes intense Milankovitch cycles. It has long cold periods where much of the water is locked up in ice, followed by long periods during which much of the water is in the sea. During one of these interglacial periods, a new island forms and breaks through the surface. Corals grow and flourish, forming an barrier reef and lagoon. During this time, exploration is rampant from the seafaring community on the northern continent. Over time, erosion from winds and waves removes the pointy top, leaving a guyot, and the lagoon is filled with the sediment, leaving the steep sides of the atoll. The island is colonized and settled for its fresh, fertile soils and lack of native fauna. As the Milankovitch cycle turns (rapidly, due to positive feedbacks), ice is locked up in the poles and the sealevel drops ~30 meters. Now, the colony on the island is trapped at the top of their guyot (quite happily, with plenty of food and no native predators) by the steep coral walls that now appear as cliffs. However, when the sun and moon align just right, the water rises just close enough to be accessible. This is when your story happens! The thing about having it be a cutoff peninsula is that will make it not all that remote from the rest of the uncutoff peninsula. But you can have a mountain range that continues along underwater, with some mountains being high enough to be islands in their own right. The Andaman Islands are like this, and these are considered remote, with the natives having lived there for thousands (tens of thousands?) of years with little or no contact with outsiders. But they are only 879 km from Bangkok. In contrast Hawaii is 4000 km from San Diego. Probably the same difference if you are in a stone age boat or a lizard floating on a log, but if you want to really be remote, you need a volcano to make land in the middle of deep ocean. Basaltic lava of the Hawaiian type will make you some beautiful steep cliffs. These are on the Big Island. Tides are the hardest part of your question. I do not understand why tides are not uniform across the Earth; subsurface features are invoked but I take away that this is not something amenable to 180 seconds of superficial Googling. Not the answer you're looking for? Browse other questions tagged reality-check earth-like moons geology tides or ask your own question. Effects on the Earth if the moon was at 1/10th current distance? What kind of planet would have a “megamareal” tidal range? World with core of changing mass, gravitational effect on tides? How can I create a new planet/satellite system that generates tides of 6-8 metres?